Jill Manning has devoted herself to the study and practice of yoga since 1998. In June 2000, she received her Bachelor of Arts degree from NYU, but more importantly her initial teaching certification from the Integral Yoga Institute in New York City. In 2005, Jill began the practice and study of Ashtanga Yoga and made her first trip to Mysore India to practice with Shri K Pattabhi Jois in 2006. 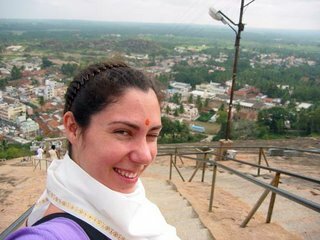 Jill continues to travel to Mysore, India annually studying with R. Sharath Jois and received Authorization to teach Ashtanga Yoga from the KPJAYI in Mysore in February 2011. She is one of only a handful of teachers in the state of Virginia with that distinction. Jill’s American teacher, mentor, and all around major influence/inspiration is Miami-based Ashtanga and anatomy teacher, David Keil. She studies “and stuff” with beloved Sanskrit and recitation teacher, Dr. M.A. Jayashree and philosophy professor, M.A. Narasimhan and credits any and all success to her majorly yogi (but non asana doing) husband Mike Mergen. She humbly dedicates her practice to her teachers. In recent years, Jill has become a sought after internationally teacher. She has been invited to teach in Scotland, Costa Rica, India; most recently in Amman, Jordan providing a two-week mind-body awareness training for Iraqi refugee women in collaboration with a local grassroots organization.